Heat oven to 375°F. Spray large skillet with nonstick cooking spray. Heat over medium-high heat until hot. Add ground beef and onion; cook and stir until beef is thoroughly cooked. Meanwhile, in medium saucepan, bring water, butter and salt to a boil. Remove from heat. Stir in potato flakes and milk. Set aside. To beef mixture, add gravy, chili sauce and vegetables; mix well. Bring to a boil. 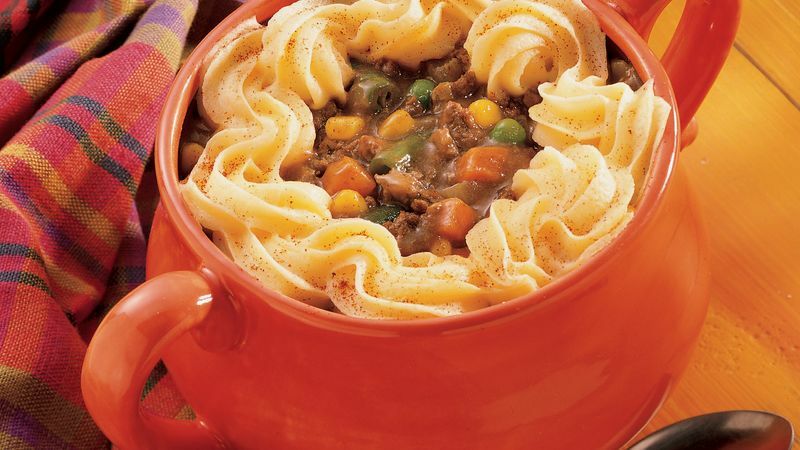 Spoon mixture into 4 (2-cup) individual ovenproof casseroles or bowls. Place casseroles in ungreased 15x10x1-inch baking pan. Add egg to potatoes; mix well. Stir in cheese. Spoon or pipe potato mixture around edge of each casserole. Sprinkle with paprika. Bake at 375°F. for 20 minutes or until potatoes are set.